The City of London has a new memorial, and it's a biggy. 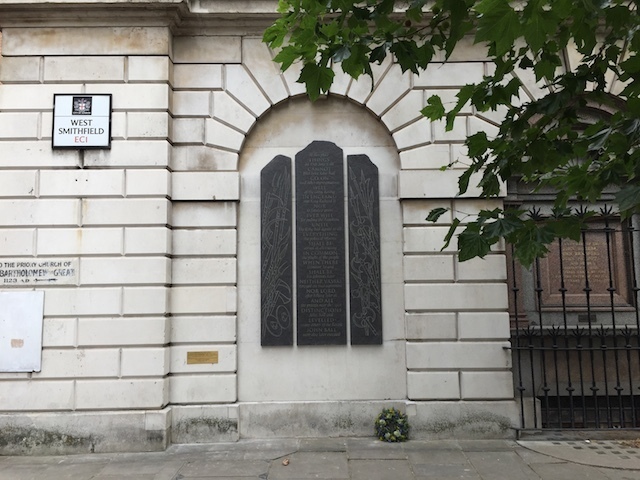 On Wednesday, Ken Loach unveiled this slate triptych on the northern wall of St Bart's Hospital, Smithfield. It commemorates the Great Rising of 1381, more commonly known as the Peasants' Revolt. The uprising saw thousands of workers march into London from Kent, Essex and elsewhere. Their grievances were many and complex. Short version: Richard II's administration were royally shafting the wider populace with punitive taxes. It all ended in Smithfield on 15 July 1381. The rebel leaders and royal party agreed to meet and settle terms. During an altercation, Mayor of London William Walworth stabbed rebel leader Wat Tyler. His death might have led to further violence, but somehow the City's forces gained control of the situation. The rising sank. Strange to relate that such a momentous event in English history has never been acknowledged by a memorial. Local resident Matthew Bell has long campaigned for a plaque, and finally saw it unveiled this week. The carvings are by Emily Hoffnung. 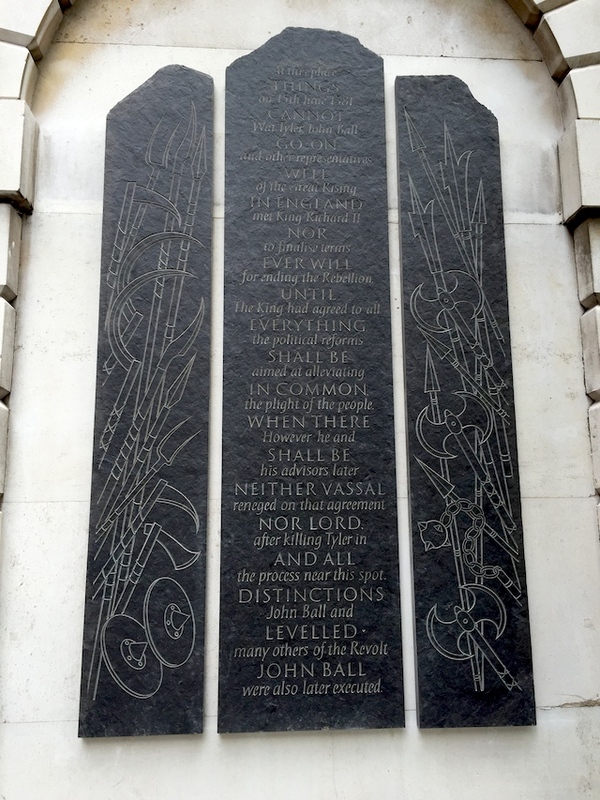 The memorial joins a host of important inscriptions at St Bart's. Nearby, you'll find monuments to the execution of William 'Braveheart' Wallace, as well as the 60 protestant martyrs, burned at the stake in the reign of Mary I. On a lighter note, the hospital also contains a plaque recording the first meeting of Holmes and Watson.